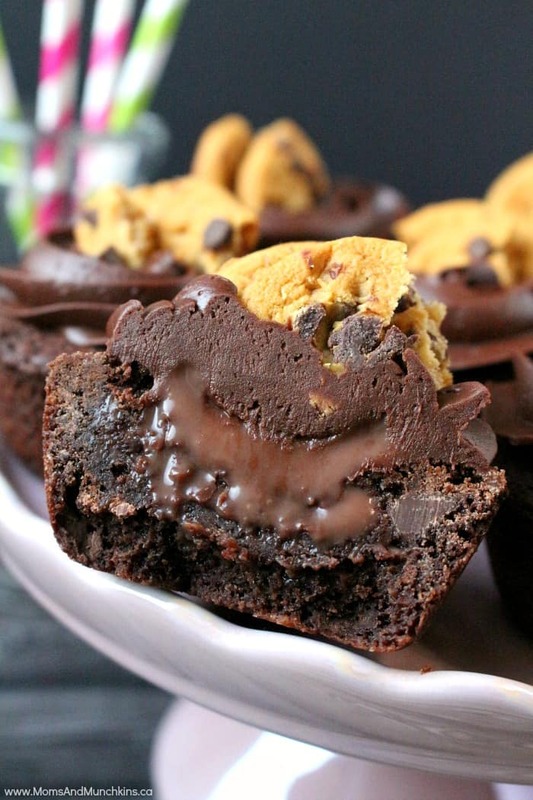 These Chocolate Cookie Cups may look like cupcakes but they are actually deep dish cookies! 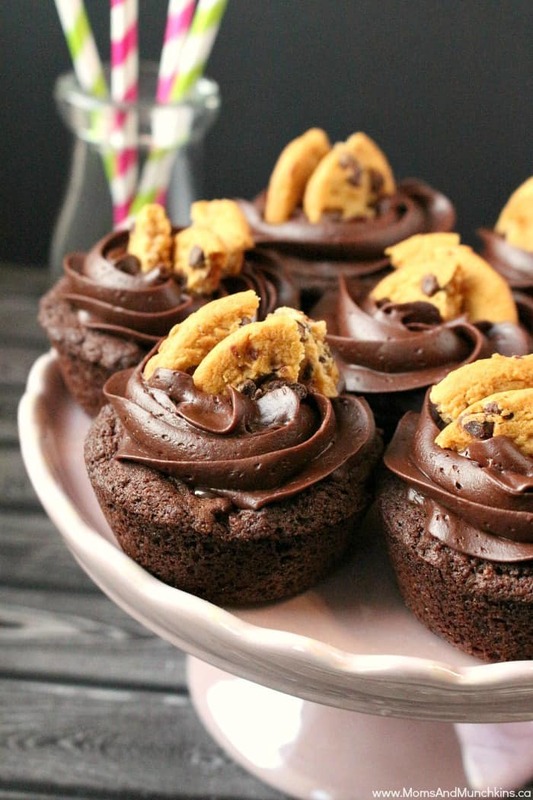 A chocolate cookie cup filled with milk chocolate ganache, topped with chocolate frosting and chocolate chip cookie pieces. Yum! 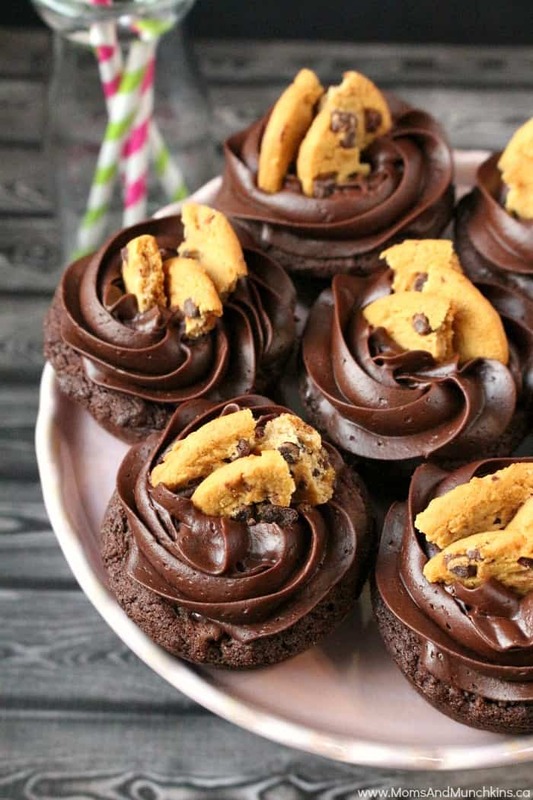 You can make these as 12 large cookie cups or 24 small cookie cups. I made these into a dozen large cookie cups because is there really such a thing as too much chocolate? Never! I’m writing this recipe out as a dozen large cookie cups so you’d need a 12 cup muffin pan. If you wanted to make these as small cookie cups, use a 24 cup mini muffin pan. For the smaller cookie cups, reduce the cooking time by about 5 minutes. You don’t want to overcook these or they’ll be too crunchy. To make these as smaller cookie cups, use a 24 cup mini muffin pan and reduce the cooking time by about 5 minutes. You don't want to over bake these because they'd be too crunchy. In a separate bowl, combine flour, cocoa, baking soda & salt. Place cookie dough evenly into greased muffin tins. Bake at 350 F for 12 – 15 minutes. Be careful not to over bake or they'll be really crunchy. Place chocolate chips in a medium bowl & set aside. In a small saucepan, bring heavy cream to a boil over high heat. Immediately pour heavy cream over chocolate chips. Let sit for 5 minutes then stir to mix completely. Once cookie cups are cool and removed from the pan, fill each cookie cup with ganache. Let these sit a few minutes while the cookie absorbs some of this ganache then fill each again. Once these have cooled, top each cookie cup with chocolate frosting and chocolate chip cookies. 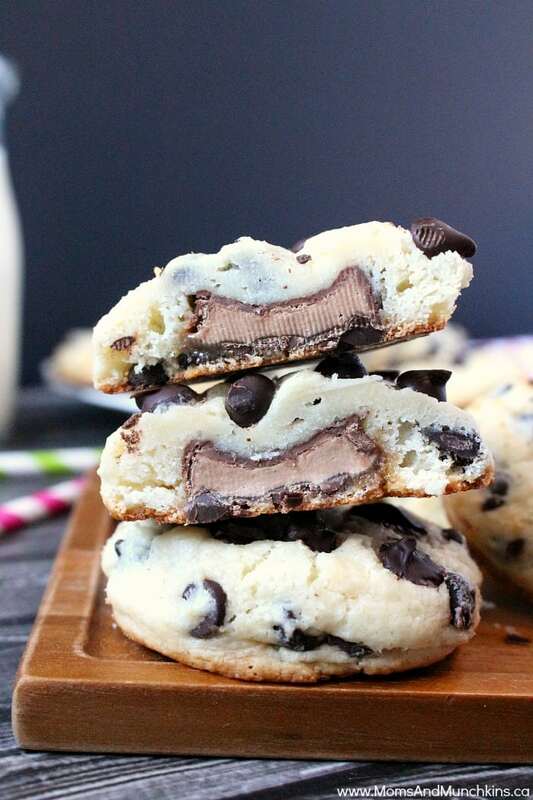 Chocolate Chip Caramel Cookies – with a hidden candy bar in the middle! 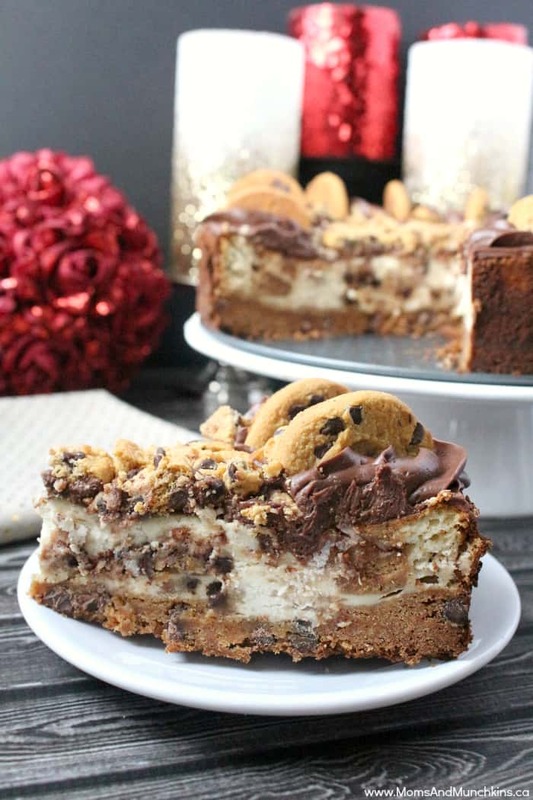 Chocolate Chip Cookie Cheesecake – I promise you that this is easy to make! For more tasty ideas, visit our Recipes page. Never miss an update by following us on Facebook, Twitter, Instagram, and Pinterest.